Objective. To compare etanercept (anti-tumor necrosis factor-α) with intraarticular (IA) corticosteroid injections to treat rheumatoid arthritis (RA). Methods. Patients with RA who had persistent monoarthritis received etanercept or IA corticosteroid injections. Efficacy was compared at Weeks 4 and 24. Results. Thirty-four patients were included (8 dropped out). Mean age was 58.8 years. No difference between groups was found at Weeks 4 or 24, but both groups showed significant improvement at Weeks 4 and 24 compared to baseline. Conclusion. Etanercept and IA steroid injections resulted in significant improvement at Week 4 that persisted to Week 24. There was no significant difference in outcome between the groups. The efficacy of systemic anti-tumor necrosis factor-α (TNF-α) therapy is established in rheumatoid arthritis (RA), but persistent monoarthritis in patients is common and often difficult to treat. The presence of TNF-α receptors in synovial tissue and cartilage-pannus junctions suggests the potential of intraarticular (IA) anti-TNF-α, but there are only a few published reports1,2,3,4,5,6,7,8,9,10. We compared the efficacy of IA anti-TNF-α (etanercept) with that of corticosteroids in patients with flare activity in single-joint RA. Patients with RA (knee, ankle, elbow, or wrist monoarthritis) were recruited from the Rheumatology Department, Academic Hospital L’Archet 1, Nice, France. They satisfied the American College of Rheumatology criteria for the classification of RA11. Inclusion criteria were age over 18 years, diagnosis of RA for over 6 months, and visual analog score (VAS) for joint pain evaluation over 40 (scale 0–100). Nonsteroidal antiinflammatory drugs and/or corticosteroid (< 10 mg/day) regimens had to remain unaltered for 4 weeks. Disease-modifying antirheumatic drugs or etanercept were permitted without dose changes for 3 months. Exclusion criteria were steroid injections during the previous 6 months, other monoclonal anti-TNF-α use, and a history of or current chronic infectious diseases. Ethical approval for the study was obtained from the local research ethics committee. Subjects gave written informed consent. The following items were checked at baseline by an investigator blinded to the given treatment: sociodemographic characteristics, self-recorded target joint pain using a 100 mm horizontal VAS, patient global assessment (VAS), joint tenderness and swelling assessment, 28-joint count Disease Activity Score (DAS28), Health Assessment Questionnaire (HAQ), erythrocyte sedimentation rate (ESR), C-reactive protein, duration of early morning joint stiffness, target joint circumference (cm), concomitant treatment, adverse events, and target joint ultrasonography. The assessment was repeated at Weeks 1, 2, 4, 8, 12, 16, and 24. Tuberculosis screening was performed before inclusion. Primary endpoints were target joint pain at Weeks 4 and 24 of followup. Injection was carried out under radiographic screening by an independent investigator, thereby blinding both patients and investigators. Needle-tip position and accurate delivery were confirmed using a Uroscop image intensifier and iodine contrast. Opaque syringes were prepared by a third investigator and contained either 1 ml (25 mg) etanercept or 1 ml corticosteroid (4 mg betamethasone, equivalent to 16 mg depomedrol or triamcinalone). This steroid was chosen to blind the procedure. Our pilot study was powered to detect a 20% difference in efficacy in favor of etanercept (α = 0.05, ß = 0.2, and SD calculated based on literature data1), with 20 patients in each group. All data were analyzed by intention-to-treat analysis. Mean significant differences between the groups were assessed using a Wilcoxon signed-rank test. Time-course changes for comparisons of VAS scores between the 2 groups were performed with a repeated-measures analysis of covariance model. Each statistical assessment was performed as a 2-sided test at a 5% significance level. Statistical analyses were performed with the SPSS program. Forty-one patients with RA were screened and 34 were included in the study (32 women and 2 men; Figure 1). Seven declined consent. 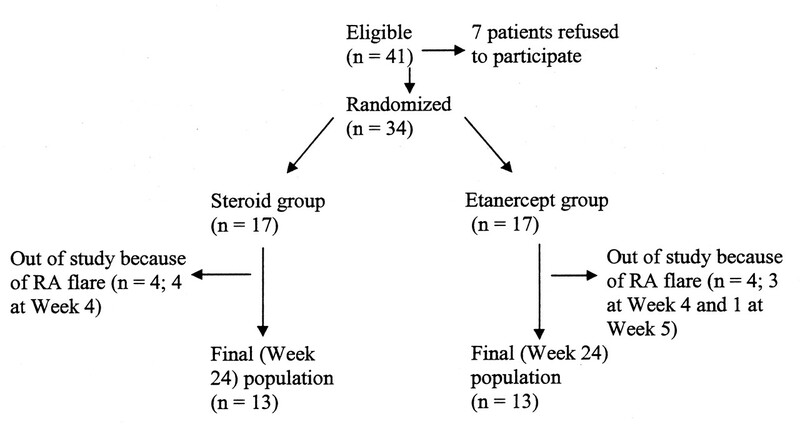 Treatment remained constant throughout the study, but 8 patients left the study prior to completion because of uncontrolled disease or a need for changes in treatment (4 at Week 4 in the etanercept group, and 3 at Week 4 and 1 at Week 5 in the steroid group). Adverse events were phlebitis (1 case in etanercept group) and breast cancer (1 case in steroid group). Mean age was 58.8 years (SD 11.2). Target joints were knee (4 etanercept and 7 steroid group), ankle (2 in both groups), wrist (9 etanercept and 5 steroid group), and elbow (2 etanercept and 3 steroid group). Participants’ clinical characteristics at baseline were similar between groups (Table 1). Trial profile. RA: rheumatoid arthritis. Patient characteristics at baseline and at Weeks 4 and 24. The target joint pain VAS score in the etanercept group was 39.1 (SD 30.8) at Week 4 and 41.1 (SD 8.1) at Week 24, with a mean decrease in joint pain VAS from a baseline of 27.9 (SD 29.0) at Week 4 (p = 0.002) and 24.7 (SD 8.7) at Week 24 (p = 0.0005). The target joint pain VAS score in the steroid group was 36.3 (SD 23.2) at Week 4 and 40.1 (SD 8.3) at Week 24, with a mean decrease in joint pain VAS of 29.9 (SD 30.1) at Week 4 (p = 0.00007) and 22.8 (SD 8.8) at Week 24 (p = 0.0001). No correlation was found at Week 24 in terms of target joint pain VAS and HAQ score or joint circumference between groups. There was no difference in target joint VAS between the treatment groups at Weeks 4 or 24 (p = 0.9 for both). The DAS28 score was significantly different in the 2 groups at Week 24 (p = 0.04). No differences between groups were found in ESR, HAQ, or synovial thickness at Weeks 4 and 24. There was no difference in the target joint pain VAS change over time between the groups (p = 0.9). In patients with RA who have persistent monoarthritis, we identified a significant improvement in the target joint pain VAS score at Week 4 that persisted to Week 24 without significant differences between the randomized IA etanercept and corticosteroid groups. A few authors have reported on IA anti-TNF-α (usually infliximab) to treat persistent arthritis; the results have varied. In a controlled study with etanercept8, with a design similar to ours and a 4-week limited followup, there were no differences between the treatment groups. Our results were similar, with persistent efficacy at Week 24 in both treatment groups. The injection methodology that we used excluded the possibility of effects associated with extraarticular injection, such as maximized local effects and reduced systemic effects that are dependent on molecule size12, molecular weight, and total exposed synovial area13. Systemic absorption6,10 could explain the moderate efficacy at Week 24, with possible differences according to the size and function of the treated joints. Subgroup analysis according to the types of joints was not possible because of the limited number of participants. Ultrasonographic guidance would be a better alternative to radiographic guidance, but it requires a practitioner who is familiar with the technique. In our study, the DAS28 score was lower in the steroid group at Week 24 (p = 0.04), with no difference in ESR. This could be due to the shorter half-life of etanercept and the greater systemic effect of steroids. IA injections of etanercept or steroids produced significant improvement in target joint pain at Week 4 that was maintained up to Week 24. Steroids are, of course, less expensive, but some patients with previous adverse reactions or limitations with regard to steroids might benefit from treatment with etanercept. Supported by the Nice University Hospital (CHU), Nice, France. Accepted for publication January 17, 2011.
. Treatment of resistant rheumatoid arthritis by intra-articular infliximab injections: a pilot study. Ann Rheum Dis 2004;63:102–3.
. Local infusion of infliximab for the treatment of acute joint inflammation. Ann Rheum Dis 2003;62:783–4. Safety of intra-articular injection of etanercept in small-joint arthritis: an uncontrolled, pilot-study with independent imaging assessment. Joint Bone Spine 2006;73:714–7. A randomized, controlled study of a single intra-articular injection of etanercept or glucocorticosteroids in patients with rheumatoid arthritis. Scand J Rheumatol 2006;35:341–5. Successful treatment with intraarticular infliximab for resistant knee monoarthritis in a patient with spondylarthropathy: a role for scintigraphy with 99mTc-infliximab. Arthritis Rheum 2005;52:1224–6.
. Intra-articular anti-tumor necrosis factor alpha antibody in recalcitrant arthritis of Behçet’s disease. Clin Exp Rheumatol 2003;21 Suppl 30:S57–8.
. Successful therapy of sacroiliitis in AS patients by intraarticular injection of infliximab [abstract]. Arthritis Rheum 2002;46 Suppl:S431. Injection of etanercept into arthritis joints: dose response and efficacy [abstract]. Arthritis Rheum 2002;46 Suppl:S518.
. Intraarticular injection of infliximab. J Rheumatol 2006;33:1912–3.
. Treatment of rheumatoid arthritis by intraarticular injections with TNF alpha blockers [abstract]. Arthritis Rheum 2001;44 Suppl:42.
. Comparison of intra-articular methotrexate with intra-articular triamcinolone hexacetonide by thermography. Curr Med Res Opin 1977;5:141–6.
. Serum methylprednisolone levels following intra-articular injection of methylprednisolone acetate. Ann Rheum Dis 1981;40:571–4.